[An interesting picture to illustrate this story from a newspaper column from 2007. Actually, reading Chinese Expats Treat Nigerian Employees As Punching Bags today on Sahara website sent me scurrying for my files for this story from 2007. The Chinese have earned great notoriety as employers of the worst kind who abuse their workers to meet set goals. It is well-known that in China, the lives of workers mean very little to employers, and the well-being is of not much consequence. It is therefore hardly surprising that they would have little regard for other people, especially Nigerian workers whose country could not care less how they are maltreated. First, the Chinese were notorious for locking up Nigerian workers in factories to meet production quotas, a practice that has led to the deaths and injuries of many. Now, they are employing Southern USA slavery-era methods to deal with Nigerian men. How long must these go on before the Nigerian government through the appropriate Ministries: External Affairs, Labor, Industry, etcetera that enough is enough? The Yoruba question in the title – have you fed my policeman – was actually asked in my presence by a power-drunk woman who operated in the corridors of [NPN] power during the Alhaji Shagari’s era. 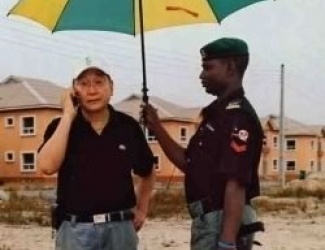 It was the era – very sane by the norms of retired General Obasanjo’s era – when Nigerian policemen were first deployed as domestic help to those in, and around power. I remember it was also when one of those zillions of princesses (like princes and assorted high-falutin chieftaincy-titled people) that litter the Nigerian landscape – then as now – threatened and promised to ensure that nwon bo aso l’orun a hapless policemen who was her own police-in-residence. She did, but thanks to a then up and coming young female magistrate who made the “princess” pay dearly for her lawless act. “Princess”, as she was called by her many admirer,s had personally physically tore off the policeman’s uniform as she had threatened, an act for which she spent some pleasant days at Agodi before the case was finally done away with. Unfortunately, I had left Nigeria before the resolution of that case but I know that our dear “Princess” subsequently had a cruel hand dealt her by luck; she is now of blessed memory. Her Yoruba words actually represent another Yoruba metaphor but our late princess could not wait to use “long leg” in getting the policeman removed from the Force; hence the commission of the act herself AND the eating of beans – another Yoruba metaphor (o lo gb’ewa) for jail time! Overfed NAOWA (army officers’ wives) trailed by soldiers carrying their pocket books – em, handbags, have been common sights in market places since the first army coup in 1966. Now, policemen regularly run errands for non-force people, including helping Nigerian men carry those funny purses they like to cling to on outings. I once asked a Nigerian man who “has arrived” why he would not leave the purse at home if he needed assistance to hold on to it! I’ve seen policemen in private homes used the way most Nigerians use domestic help but before we get to how this sad situation arose, allow me to present more of the abuse of policemen in a country that has become too bastardized for words. Nnamdi Uba (a.k.a. Andy Uba), the President’s “bedroom assistant” as the AC Party has described President Obasanjo’s “son”, has had a State Police Command in the palm of his hands for years. He and his brothers made sure Anambra State Police functions as they wish and that is not derailing from the topic at hand. Recently, when policemen who serve as bodyguards to Chris Uba were withdrawn, it made national news. Here is how a favorite tabloid reported it: “The Inspector General of Police has withdrawn the security men guarding Chief Chris Uba. …It is widely believed that the withdrawal of his security is a fallout of the raging battle among the Uba brothers which has pitched Chris … Ugochuckwu against Andy …” Pray, who are these characters one of whom reportedly used to operate a non-mechanized tiny car wash while the “most illustrious” was neither a “returnee” nor an achiever from the USA although he has money smuggling, forged claim to university degrees among his rap sheet? Yet until recently, the car wash guy was one of our President’s closest allies while the “most illustrious” – rap sheet and all – is headed to Anambra Government House as governor. Of course, Anambra citizens are not likely to vote for him but so what? Remember, they did not vote for diminutive I’ll-swear-an-oath-at-a-shrine, Catholic-faith-or-not PDP Chris Ngige who was declared “winner”. While speaking about the abuse of policemen, remember how late Police Officer Ige was used in the subversion of the law of this land in Anambra? And remember how Obi as governor of Anambra told this nation recently through THE NATION that he was yet to receive his security back. While policemen serve as domestic helps in the homes of the rich and powerful, they were apparently nowhere to be found when the Uba brothers purportedly caused Anambra State untold hardship – burning properties, including government properties, etcetera. I wish to state, dear compatriots, that Ehindero, who once offered hope for a respected, restructured and disciplined police force has done more to hinder the development and operation of the Force than, perhaps, any of his predecessors. He heads a demoralized, very corrupt Force in which men and women sign for salaries half of which they are lucky to receive. He is a beneficiary of an unheard-of tenure extension and attends PDP rallies. Now, we can all see why these men and women jump at jobs at the homes of the rich where they are guaranteed food? The Nation on Sunday, February 2007.